Disney has brought on director Guy Ritchie to take the helm on the studio's upcoming live action remake of their 1992 animated hit Aladdin. John August has been set to write the script, with Dan Lin producing through his Lin Pictures company. The project has been described as an "ambitious and non-traditional" take on the beloved story. The original 1992 animated movie followed a young man who finds a magical lamp and is granted three wishes by the genie inside, as he is pursued by the nefarious villain who wants the lamp for his own evil ends. The Hollywood Reporter reveals that this new project will still keep several musical elements of the original movie, but the story will be told through a non-linnear narrative, an approach Guy Ritchie is certainly familiar with. The studio is also deciding ow to approach the iconic genie, who was voiced by the late great Robin Williams in the original movie. The original movie was a box office smash hit, earning $217 million domestic and $504 million worldwide, from just a $28 million budget, which was the highest-grossing movie of 1992. When adjusted for inflation, that total equates to a $454.1 million domestic take in today's market. It also won two Oscars for Best Score and Best Original Song for "A Whole New World"The original movie launched a slew of straight-to-video sequels, and it has recently been adapted into a Broadway stage play. We reported last year that Disney is developing a live action prequel to Aladdin entitled Genies, which is being written by Damian Shannon and Mark Swift. 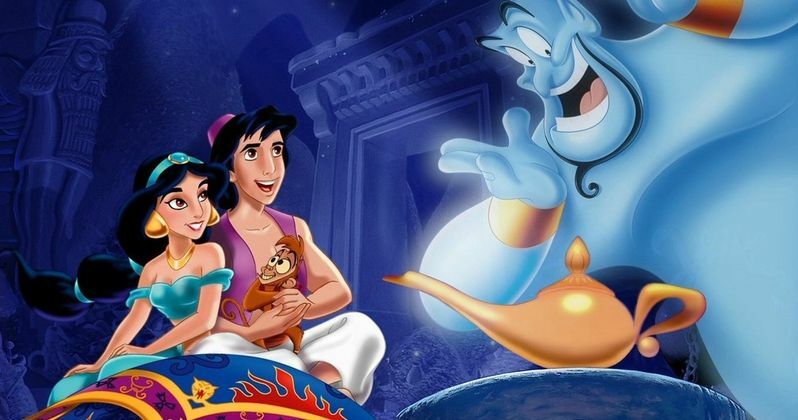 That report revealed Genies would spawn a live-action remake, so it's possible that both Genies and this Aladdin remake are connected in some way, but we don't know for sure. Tripp Vinson is producing that project, but we haven't had any updates on that since the initial report. Guy Ritchie most recently directed The Man From U.N.C.L.E. and his next film King Arthur: Legend of the Sword, starring Charlie Hunnam, will hit theaters on March 24, 2017. We also reported earlier this year that the director will reunite with Robert Downey Jr. for Sherlock Holmes 3 that will reportedly start filming this year, but we haven't had any recent updates on that film. This Aladdin film will mark the director's first project for Disney.